Black rainbow label without "subsidiary" rim text. Labels list Ken Thorne as the writer of the last track on side 2 and list "You Can't Do That" as part of track 4 on B-side. Other label variant for this pressing is similar but does not list Ken Thorne as the writer of side 2 track 4 or 6 and does NOT list"You can't do that as part of track 4 on B-Side. There are those who will suggest that Help! 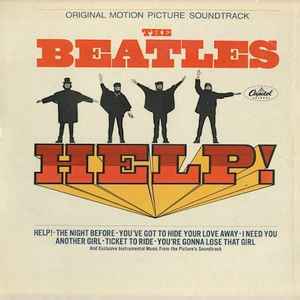 is haphazard and lacks a glowing intensity, yet I’m not one that agrees, finding the collection of tunes that “Help” (the movie) was built around, to be bright and infectious, glowing with a warm intensity. Much changed with the album, even if the movie never existed, the music soared to new levels, where the boys developed not only a forward looking path to arrangements and studio expansions, but with a more defined and purposeful palette when it came to their instrumentation. Hearing the Beatles at this stage was akin to flipping on a light switch, stepping from a rather normal sound and into a sonically dynamic field of freshness. With that in mind, while the movie may have been a bit silly, it was a great vehicle for presenting the lads, as their songwriting also took a huge step forward. Simply consider “Ticket To Ride,” or the dynamic percussions flowing though “You’re Gonna Lose That Girl,” not to mention the brilliances of “You’ve Got To Hide Your Love Away.” These where were all songs presented in a style laced with sounds, textures and attitudes that where totally new to the world. And I haven’t even mentioned the title track, where “Help” nearly bursts from your speakers like a storm, a virtual explosion, frantic, filled with the emotion of a desperate message. Yes, Dylan’s lyrical writing style had a great effect on John, Paul, George and Ringo, as did their rather open use of marijuana and other substances that wove their effects into the music, where the numbers can be appreciated on a variety of levels, the songs sound more straightforward, yet embraced a deeper sense of introspection and vision. Then there’s the song “Another Girl,” infused with bluesy slide guitars that I can’t help but feel were influenced by Brian Jones of the Rolling Stones. Of course one can not ignore the first use of a twelve string guitar on this album, and the depth of sound that instrument alone brought to the music. On a whole, the complexity to the album came from what the album brought forth in its entirety (meaning the whole was greater than the sum of its parts), with each song standing alone with its own brilliance, seeming to deliver a new idea and a new concept one song at a time, where those lyrics and musical presentations would all morph together in later songs, where all of these single concepts and musical aspirations would interlace each individual song (meaning that the sum of its parts was equal to the whole), creating future albums that were sonic masterpieces due entirely to the fact that each number was a sonic masterpiece in and of its own right. All of this changed the manner by which listeners consumed the music. Yes, there were singles from the album, matter of fact there were three number on singles, yet it was this new attitude of hearing an album as a collective unit that changed. Gone were the days of dropping 45’s onto the record changer and chatting with the music playing in the background, as a new tribal door opened, where albums were heard by a couple of people sharing a listening experience, discussing the music, having fun with it of course, but knee-deep in the phrasings, the double meanings, the musical structures and the new sophistication that was emerging. Certainly this puts Help! at a turning point, revealing it to be a cornerstone in the design and appreciation of music. This all suggests that Help! is far more than a musical soundtrack to a Beatles romp, and when listened to in that context, forgetting the backdrop of the movie, the album holds its own as being bright and forward looking, as well as deeply emerged in the sea-change of the social constructs that were being ushered forward during the turbulent and beautiful mid 60’s. *** The Fun Facts: The album cover shows the Beatles with their arms positioned to spell out a word in flag semaphore. According to cover photographer Robert Freeman, “I had the idea of semaphore spelling out the letters “HELP,“ but when we came to do the shot, the arrangement of the arms with those letters didn't look good. So we decided to improvise and ended up with the best graphic positioning of the arms.” On the UK Parlophone release we see the letters formed by the Beatles appear to be ‘NUJV,’ while the US release for Capitol Records rearranged the image slightly, appearing to spell out the letters ‘NVUJ’ due to McCartney's left hand pointing to the Capitol logo … no doubt a great bit of considered product endorsement. Also, the Capitol album was issued as a deluxe gatefold sleeve with several photos from the film and was priced at one dollar more than standard Capitol releases at the time. NONE of the instrumental tracks on this LP have anything to do with George Martin; Martin was snubbed by Richard Lester for recieving the only Oscar nomination for 'A Hard Day's Night'! Ken Thorne, who often worked with Lester, was brought in to do the incidental score (stealing from The Beatles' catalogue and many classical reference discs, to whom he gave no credit!!! The performer credits for this entry (in any of its configurations) are least half incorrect. The George Martin Orchestra appears on NO tracks on this album, including the unlisted James Bond theme intro. Tracks 3, 6, 8, 10, 12 and the Bond intro were all the work of Ken Thorne's Orchestra, as is explicitly stated on the album jacket and the on-screen movie credits. George Martin famously loathed working with the film's director Richard Lester on A HARD DAY'S NIGHT, and declined the job for HELP! Thorne is even credited with the three non-Beatles compositions, yet nobody seems to have noticed. On the surface it’s easy to dismiss The Beatles Help! as nothing more than a Marx Brothers romp across the world, as a rag-tag crew of ne’er-do-wells go to outlandish lengths in an attempt to steal a mystical ring from the hand of Mr. Starr ... and if you haven’t seen this tongue in cheek film, please do. But below the surface, with Sgt. Pepper just around the corner, both the film and the music relay what happens when the public image of The Beatles smacked up againts their actual inner lives; lives filled with fame, paranoia, failing marriages, and the need to become adults, with original thoughts, in a world that wanted nothing more than to keep the Fab Four and Beatlemania rolling on and on and on. These were heady dark days, and it’s true, people were looking for something to take their thoughts away from the Cold War and the ever impending conflict in Viet Nam, that with each passing day brought Beatle fans one step closer to the Induction Center. Counter The Beatles wisecracking frolics with the Civil Rights movement that was changing everything that Americans thought they knew and understood, and it’s no wonder that this is a confusing misunderstood album, one with a foot in two time periods, with The Beatles wanting nothing more than to be taken seriously, to comment on all they saw around them, and their place to effect and influence others. The song “Yesterday” is a prime example, and while certainly personal, much more light and airy than the 900 plus opus covers it would spawn, signifying not a song of love gone south, but of the times in which we all found ourselves living, where what we thought we’d known [yesterday], actually did seem far away as compared to the headlines of the world. The Beatles almost seemed to be putting on a disguise, an act that became a reality with Sgt. Pepper, where The Beatles freed themselves to do anything they wished by creating an alternate band. Just listen to Lennon on “You’ve Got To Hide Your Love Away,” where in a Dylan influenced fever he swaps well known harmonies, changing his voice and tenor, almost slashing in his attempt to keep the music rags at bay, to carve out some private space for himself. Yet there’s still a naiveté in the McCartney song “I’ve Just Seen A Face,” a playful number of innocence and first love that connects those early years with these pot smoking changing times. Keeping in mind the atmosphere from which it rose, Help! was not just a soundtrack to a movie, it was the music for opening credits to the counter culture revolution, one where youth in all of its glory was plastered across the silver screen in living colour and stereophonic sound. Help! defined a corner being turned, and for a brief year and a half of brilliant music, laced with liquid acid, all change seemed magically possible, as if by sheer will and good thoughts, wrongs would be righted, the heavens would part, and the horrors of a previous generation, pushed aside. Like it or not ... take it seriously or not ... Help! is an album that needs to be reckoned with. *** Pick the UK edition, it’s the only one worth considering.